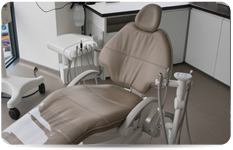 Riverpoint Specialist Dental Clinic routinely operates between 08:00 and 17:00 or between 09:00 and 18:00 depending on patient needs and the dental problem on specific days. 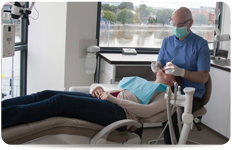 Riverpoint Specialist Dental Clinic is located on the first floor of Limerick’s tallest building, the Riverpoint building, in Limerick’s city centre. The main entrance to the building is on Lower Mallow Street, directly across the road from the main entrance to Jury’s Inn hotel. Please see our Location page for further details. A letter of referral or a referral form completed by your dentist is desirable as it expedites your assessment process, potentially reducing your appointment time. An email, fax or telephone referral from your dentist would perform the same function. However, a letter of referral from your dentist is not essential as your primary dental problem and the history of the problem can be established during the assessment appointment. If I need to be assessed by more than one specialist will I be charged for both consultations? In the event that your dental problem needs to be assessed by more than one specialist you will only be charged for one consultation. This will be the case even if you are examined on subsequent visits by different specialists for the same dental problem. An assessment appointment is typically either of 30 minutes or one hour duration, depending on the complexity of the dental problem being assessed. Will I get a treatment plan on the first day? A treatment plan can generally be provided at the assessment appointment when the required treatment is straightforward and/or is likely be carried out in a single treatment session or over a minimal number of treatment sessions. For more complex dental problems it will not always be possible to provide a definitive treatment plan at the first assessment appointment. Will I get a written fee quotation before I start treatment? A written quotation will be provided to you for the required treatment prior to the commencement of the treatment. Treatment at Riverpoint Sepcialist Dental Clinic can be paid for using cash, cheque and all major debit and credit cards. Do you accept medical cards/PRSI? Unfortunately, dental treatments provided at Riverpoint Specislist Dental Clinic are not subsidised by medical cards or PRSI contributions.